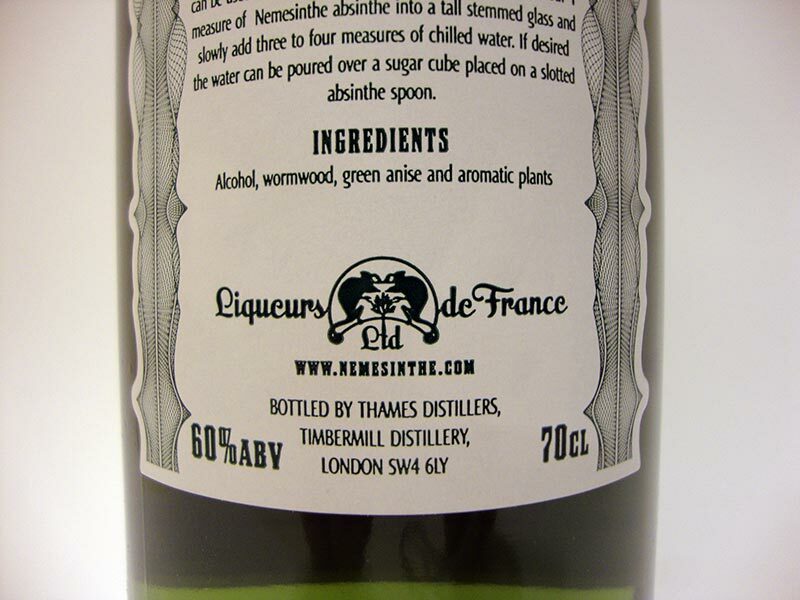 A low priced essence based absinthe produced in the U.K for the absinthe renaissance company Liqueurs de France. Sounds strange to many, including me. So is it up to LdF standards? Well, almost. 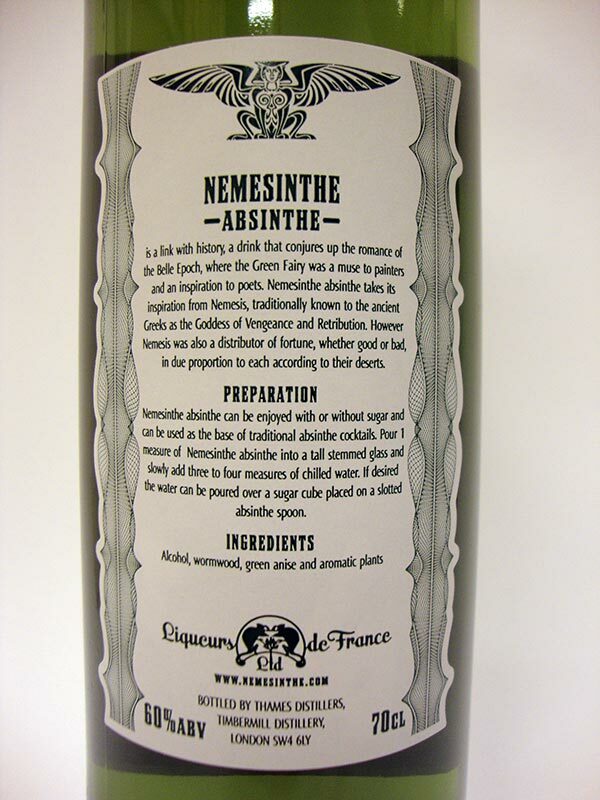 The Nemesinthe Absinthe is produced in London by Thames Distillers for Liqueurs de France. It's an essence based absinthe verte at a rather decent price tag. 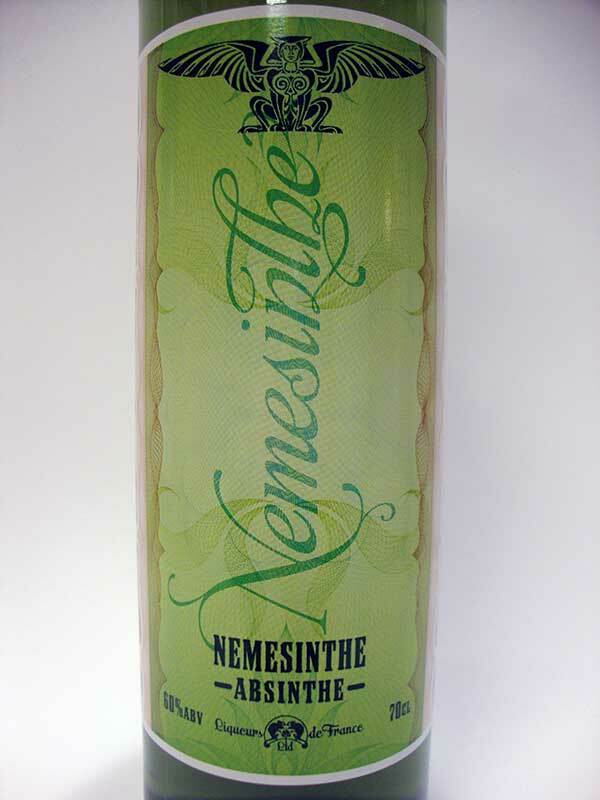 The color of the Nemesinthe is a very nice green, natural looking and without any of the weird blue tones so often found in artificially colored absinthes. Pouring a shot of the Nemesinthe in a glass opens the door for its aroma, though it doesn't exactly jump at you. Before water is added it does lend some hints of the classic absinthe ingredients and also a touch of vanilla. However there is also this quite typical scent you often find in essence based absinthes. Probably from the anise essence. There is nothing that stands out and the aroma is rather uninteresting. After adding iced water the aroma is pretty much the same. A little more vanilla and a faint bitterness lingers in the perfume of wormwood but it's still quite flat. Slowly adding iced water into the Nemesinthe results in a nice enough louche but with no "drama". It simply louches... I does so well and turns completely opaque though so on that note, there is nothing to really complain about. The color after the louching though is a bit different. It still holds a bit of the original green in an odd way which makes it more greyish green than the lighter green leaning towards milky white which you'd typically find in a fine absinthe. The mouthfeel is actually quite nice at first - creamy and quite rich and full. After a while it leaves a slightly oily feeling on the tongue though but this goes away in a short time. I'd say on the whole, after a few sips, it's a rather average mouthfeel. The taste is nothing spectacular but I wouldn't say it's bad. 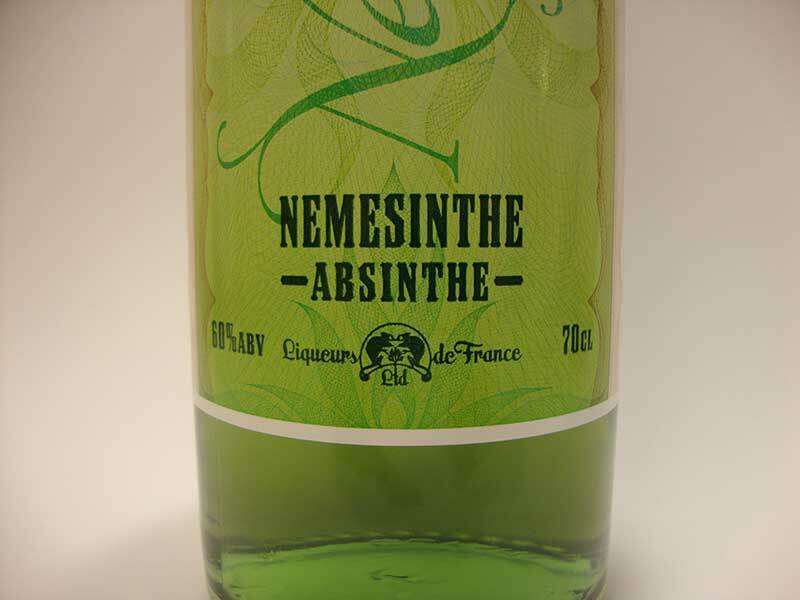 Compared to many essence based absinthes, it tastes a lot less chemical. The essences are obvioulsy well made and the blend is definitely carefully developed. I'd lie if I say this is an excellent absinthe, but for the money it's not terrible. Of course, none of the wonderful aspects of a good distilled absinthe are really present but at least this is a decent mix. One thing that strikes me though is that the taste does get dull after a while simply because it lacks the complexity of a distilled absinthe. But perhaps this would actually make it good for experimenting in cocktails. This is mentioned on the label and I guess one day I will make something with this as the absinthe base. So, what does it all add up to? 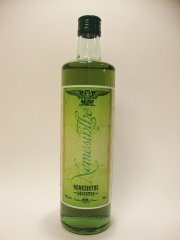 This is an essence based absinthe which on its own makes it hard to reach the top. It should get extra points for good effort though. It's one of the better essence based absinthes I've had in a while, partly because the color is nice and there's no strange chemical taste or excessive bitterness. Will I drink it again? I guess, in a cocktail one day. For the every day absinthe I have several others I'd turn to first.